If you receive a Notice of Intended Prosecution (NIP) through the post, it's important that you deal professionally and knowledgably when corresponding with the police. The keeper of the vehicle has a legal obligation, under Section 172 of the Road Traffic Act, to provide the name of the person who was driving their vehicle at the time of the alleged motoring offence. If the keeper cannot remember who was driving their vehicle, they may be liable to prosecution. The Constabulary may write back and state that "the photograph is not intended to identify the driver, it is simply a means of identifying the offending vehicle". By providing a list of possible drivers. If the keeper fails to name the driver, they may be liable to prosecution and the punishment could be worse than for the speeding offence, i.e. 6 points, a fine and costs. From 24 September 2007 the penalty for failure to comply with S 172 goes up from 3 to 6 points: Road Safety Act 2006 section 29. 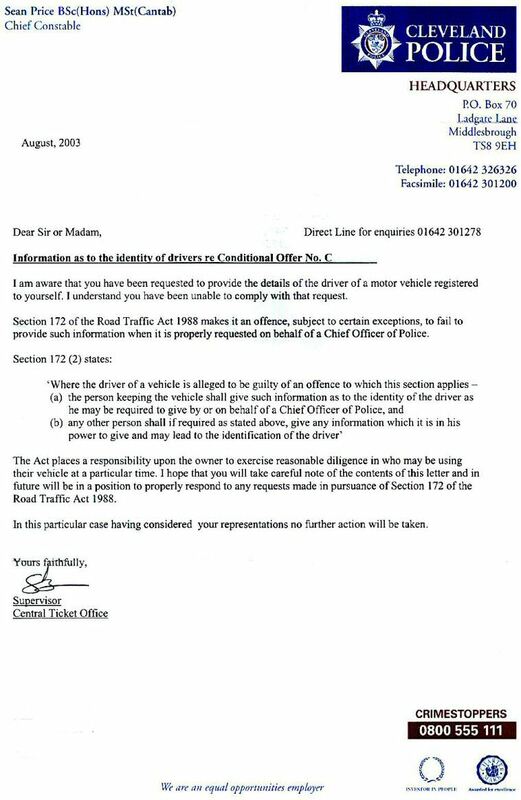 "A person shall not be guilty of an offence by virtue of paragraph (a) of subsection (2) above if he shows that he did not know and could not with reasonable diligence have ascertained who the driver of the vehicle was". The key here is "with reasonable diligence", and it is up to a court to decide whether or not the register keeper has shown reasonable diligence. A copy of the relevant pages of the operator's notebook, detailing the entire chain of events starting from when, for example, he parked the van to when he packed up and drove away. The above information will only be disclosed at a later stage if the "named driver" decides to contest the allegation. For a limited company, RTA 1991 Section 21 (2) requires the keeper of the vehicle to identify the driver. Subsection (3) makes it an offence for the keeper to fail to comply. Subsection (4) provides a defence if the Keeper shows that he did not know who the driver was and could not have found out by using "reasonable diligence". The sting in the tail for limited companies is in Subsection (6) which provides that for a company to establish the Subsection (4) defence it must prove that in addition to the matters in (4) the Company did not keep a record of who was driving the vehicle and that the failure to do so was reasonable. It is being suggested that companies ought to keep such records. For example if pool cars are used, there should be a system of signing in and out. If the company does have such a system but it didn't work on a particular occasion that might suffice. There is also the sting in the tail in subsection (5) which says that where a director or senior manager of the company caused or connived with the failure to identify the driver, that person is also guilty. The problem is that companies can be fined but can't get points - however, Directors can. We believe that most forces prosecute the company and not the Directors for failing to identify as this leads to a conviction and fine without any effort. If they also prosecuted the Directors (solely to get points put on a licence), most would fight. This Constabulary "company" was successfully prosecuted under Section 172 for failing to provide the name of the driver! Update - 16th March 2004. Idris Francis lost his High Court appeal. Therefore, it's considered that for most practical purposes the loophole is closed; the complete judgement in the case can be read by following this link. The European Court of Human Rights (ECHR) has rejected the combined appeals of Gerard O'Halloran and Idris Francis against the United Kingdom by a majority of 15 to 2. Mr O'Halloran was compelled to name himself as the driver of a car at the time of an alleged offence under threat of criminal sanction under S172, and that was used to convict him of the criminal offence of speeding. Mr Francis refused to incriminate himself and sent a letter to the police to the effect that he was asserting his rights under Article 6.1 of the European Convention on Human Rights. He was convicted of failing to provide the driver's details. For the latest details of the case and up-to-the-minute analysis of the ECHR decision and its implications visit our forums.